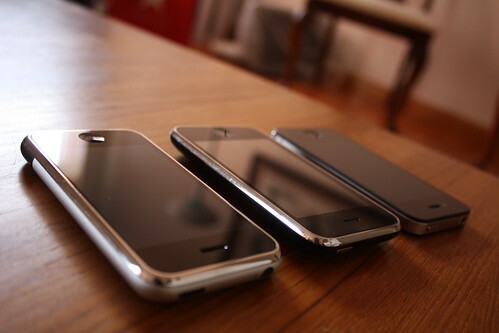 The first generation iPhone (2g), the third generation iPhone (3GS), and the fourth generation iPhone (4). The straight edges of the face of the iPhone 4 give the illusion of a larger black bezel around the screen, notably above and below the screen. The curvature in the first three generations gave the illusion that the bezel disappeared earlier. The second and third generations (3G and 3GS) had much more gradual curves in the back, making the phone look thinner when viewed from the front and sides.